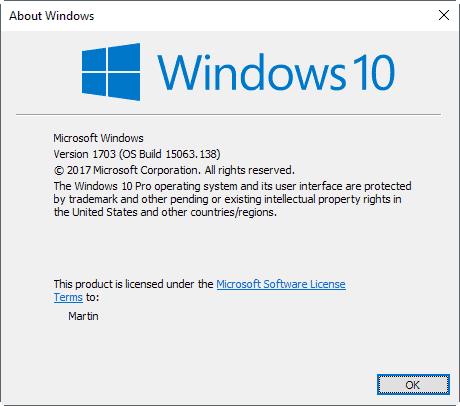 Windows 10 uses a different support model as older versions of the operating system such as Windows 7 or Windows 8. In previous versions of Windows, the end of support date was always the end of life of the operating system. A release of a service pack for an older version of Windows, the last was released for Windows 7, would mark the beginning of the end of support for systems without that service pack. Microsoft switched to a servicing model in Windows 10 instead. Support on Windows 10 is determined by the Current Branch for Business. Current Branch (CB) — for all editions of Windows 10. Current Branch for Business (CBB) — only for professional editions of Windows 10. The core difference between Current Branch and Current Branch for Business is that updates are released to Current Branch devices as soon as they are available, but delayed for about four months before made available to Current Branch for Business systems. Microsoft will always support the two latest Current Branch for Business releases. Whenever a new edition of Windows 10 is made a Current Branch for Business release — this happens four months after initial release — the grace period for the oldest Current Branch for Business version begins. In the case of Windows 10 RTM, both the November Update (version 1511) and Anniversary Update (version 1607) of Windows 10 are Current Branch for Business versions. The promotion of the Anniversary Update version to CBB started the support grace period for Windows 10 RTM. The same will happen when the Windows 10 Creators Update is promoted to the CBB channel. This will happen in August, and about two months later, Windows 10 version 1511 will reach end of life. You may say that this is similar to support changed when Microsoft released Service Packs for older versions of Windows. This is true to a degree, but there are a couple of differences. First, the support period is shorter on Windows 10. Non-Service Pack versions of Windows were supported for about 2 years after the release of the Service Pack. On Windows 10, the support period for any version is about 18 months. Probably the biggest difference to before is that feature updates are released at a much higher pace than Service Packs. Microsoft released three feature updates so far since July 2015 for Windows 10. The next feature update will be released at the end of 2017, making it four feature updates in about 2 years. Another difference is that Microsoft made it a lot harder to block updates on Windows 10. Most Windows 10 machines are no longer on the RTM version, unless the system administrator changed system settings to block updates from being deployed on it. The faster release scheme makes it difficult for Enterprise customers who don’t run the LTSB to keep up. This year will be especially taxing for IT departments as Microsoft plans to release two feature upgrades (the first was the Creators Update). The About Windows window should load. It lists the version of the operating system right in the second line. Compare the version to the list below. 1507 — Initial version of Windows 10. 1511 — The November Update. 1607 — The Anniversary Update. This entry was posted on Wednesday, April 26th, 2017 at 10:48 am	and is filed under General News. You can follow any responses to this entry through the RSS 2.0 feed. Both comments and pings are currently closed.